The lamb was perfectly cooked, with a nice amount of tang from the pomegranate molasses. The couscous & salad were ok, but nothing out of the norm. We found this to be a very ‘oily’ dish. The buttermilk mash & chorizo crumbs only served to heighten this. It was tasty, but I think it will be unlikely to make a repeat outing for us. 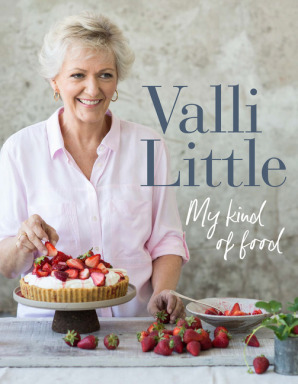 In My Kind Of Food, her most personal cookbook yet, Valli shares 100 recipes that she has cooked time and again to share with the people she loves - recipes that are perfect for simple midweek meals and lazy Sunday suppers; slow-cooked sensations that will have you begging for seconds; dishes that burst with colour and flavour, making the most of incredible seasonal produce; as well as a wicked selection of Valli's signature cakes and favourite chocolate-inspired desserts. Whether you want to prepare a memorable meal for a special occasion, have some friends over for a leisurely weekend lunch, or quickly whip up something yummy for your hungry family at the end of a busy day, My Kind Of Food is the closest thing to having Valli cook for you at home.